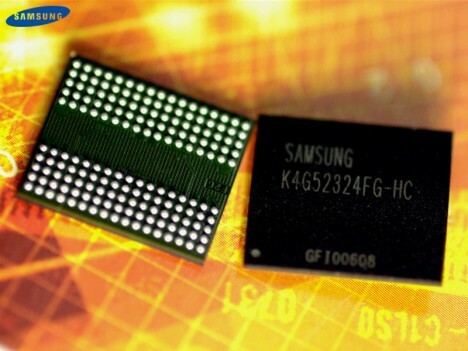 Samsung Electronics announces that it has begun mass producing GDDR5 graphics memory using 50 nanometer node process technology. Mueez Deen, Director of Mobile and Graphics Memory Division, emphasized that introduction of GDDR5 helps to meet the growing demand for higher performance graphics memory in PCs, graphic cards and game consoles. GDDR5 is the fastest and highest performing memory in the world presently that will give outstanding gaming experience across all platforms. Samsung’s DDR5 is designed to support a maximum data transfer speed of 7.0Gbps (gigabits per second) and will render 3D imaging with a maximum 28GB/s, which is more than 2x faster than previous fastest graphics memory bandwidth of 12.8GB/s of GDDR4. The ultra-fast processing speed is equivalent to transferring nineteen 1.5GB DVD resolution movies in one second. It is achieved with GDDR5 operates with a free-running clock that does not require the data read/write function to be synchronized to the operations of the clock. The high image processing speed of the GDDR5 supports the latest data formats (Blu-ray and full HD). Samsung’s GDDR5 operates at 1.35 volts (V), which represents a 20 percent reduction in power consumption compared to the 1.8V at which GDDR4 devices operate. The GDDR5 is now available in a 32Mb x32 and 64Mb x16 device configuration. Samsung expects GDDR5 to account for over 20 percent of the total graphic memory market in 2009.